How many website visitors do you need ? Are Marketing Experiments Spooky ? What's Working for Your Competitors ? What are people doing on your website ? 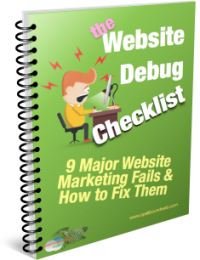 Do Your Online Campaigns Fail ? What worked better in 2014 ? Do You Have a Goal in Mind ? Is Promotion Making You Poor ? One of the best statistics to measure the success of a business is money-in ( the profit of course ). But profit is a final stage in a flow of actions that need to occur. 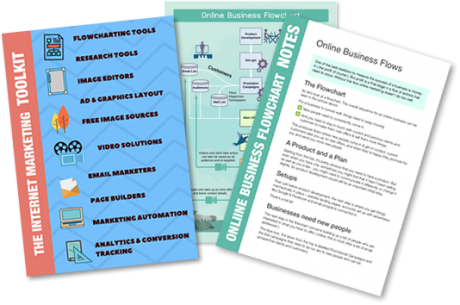 Without this flow online marketing doesn’t do too well. So let’s look at a flowchart. 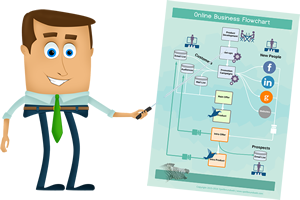 The overall sequence for an online business can be seen in the picture above. For a business to survive well, things need to keep moving. New people need to consistently come in. And you need to stay in touch with current and previous clients and customer to make them new offers & sell them more things. This produces flows where new people come in & get in contact, current customers take you up on new offers, and when they’re happy they promote for you and send you more new people. Starting from the top, it’s pretty obvious that you need to have a product. But even when you have one, sometimes you might find that it hasn’t been selling as well as you’d like -you might need to communicate it differently or change it slightly. So product development would still be an important initial step. Then just below product development, the next step is where you get things mechanically in place – website landing pages, accounts set up with advertisers like Google & Facebook and email programs connected in. The next step in the flowchart concerns building up a list of people who are interested in what you have to offer ( online, this list is most often a database of email addresses ). The blue box, 3rd down from the top is labelled Promotional Campaigns and the first campaigns that need to be run are to new people who are likely prospective clients and customers. You have your established clients and customers ( shown on the left of the diagram ). But before they become clients or regular customers, they are new people. In the flowchart, the right side lists some of the places that ads can be run to them. You can find people surfing the web at any of the places listed on the right of the chart. And of course you can contact any people that you already have email addresses ( or phone numbers ) for. But there’s a big difference between new people and people who already know you. New people don’t trust you yet, so you need to treat them very differently to established customers who you’ve spoken to or have who have done something with you. The offers made to new people most-often need to be different to those made to your clients and customers, with MINIMUM risk. They should be sent to a page on your website that makes an offer in exchange for some sort of contact information or action. If the offer is taken up, then you now have a hot prospect, or customer. If not, its possible these days to re-target people who have visited your website, allowing you to promote to them specifically and follow them up. Put an add in front of new people. Some will click through to a page on your website. On the website page, offer the visitor something that involves no-risk. Ask for their email address ( or phone number ) in exchange for the offered thing. This is what builds up your list of potential customers and clients. But its only after they’ve built up some trust in you, that they’ll spend a reasonable amount of money.